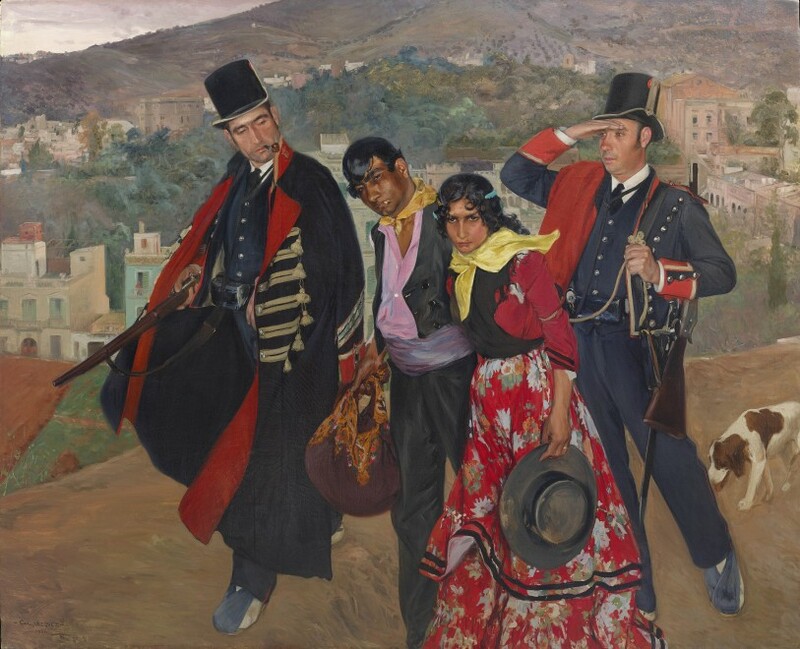 Expositión General de Bellas Artes, Madrid, 1906, no. 1249. Salon de la Société des Artistes Français, Paris, 1907, no. 1590. Exposicion Universal del Centenario de Buenos Aires, 1908. June 1907, p. 453, ill.
Ilustrada , Bilbao and Madrid, 1929, vol. 67, pp. 387-389, ill.
Carlos Vazquez , Barcelona, 1932, pp. 97-98, ill.
Society of America, New York, 1932, vol. 1, p. 511. Madrid, 1988-93, vol. XI, p. 190.
painting in his studio on August 31, 1944.
appended to it a French translation – “gendarmes Catalans ” – and it earned him a silver medal. seem to be either escorting them out of town or taking them to jail followed by their sad dog. seems someone not to be trifled with!